In this dictionary I also found an entry on 'Magnetic Declination'. Magnetic Declination is the degree to which the magnetic field that you are in varies from the magnetic poles ( you have to make an adjustment, depending on where you are, to get a true magnetic north reading from your compass ). But, more importantly, this is related to 'Magnetic Striping' which is one of the things used by geologists in continent reconstruction.When fresh rock emerges at the sea-beds it is magnetically 'striped'. This striping is permanent and can tell geologists where a particular piece of land was positioned when it formed. 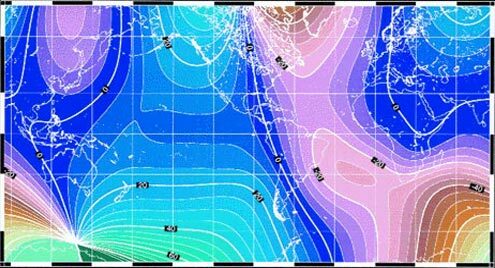 The next morning I found that the world magnetic declination map suggested magnetic striping of North and South America that matched when realigned in the way I had proposed. There is new volcanic material being added to the North American West coast, from the Pacific, all the time, but they make little difference to the overall. These facts, combined with the seabed and fault-line maps, egged me on.